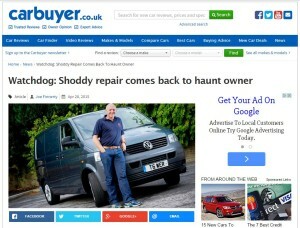 A 2007 collision repair not up to Volkswagen’s standards has come back to bite a driver and an insurer in Leeds, the British consumer advice and auto reviewer website Carbuyer reported Tuesday. An auto body shop approved by British insurer AXA repaired Karl Greaves’ Volkswagen Transporter van after a collision in 2007 affecting the rear wheelarch, the website reported. About a year and a half later, the paintwork bubbled, and the shop told him the work was only guaranteed for a year, according to Carbuyer. A broker listened to his complaint but didn’t take any action, the site said. Nissan to make automatic braking standard in Japan soon; no word on U.S. In 2014, a routine auto service by Volkswagen found rust in the wheelarch. “VW investigated the matter and said that it wasn’t covered under the bodywork warranty, as the repair work hadn’t been done to manufacturer standard,” Carbuyer reported. That put Greaves in a bind, as he was hoping the van could be put toward the purchase of a new Transporter, according to the site. AXA said it used to outsource repairs but now does them in-house. The story shows why it is so important to follow the OEM guidelines for work, as was observed at the Repairer Roundtable ahead of the Atlanta Collision Industry Conference. Otherwise, someone — whether it’s the collision repairer, insurer or customer — can take a financial hit, and the vehicle could even be unsafe.